The Gustavus women's basketball team rallied in the final five minutes to defeat Hamline 55-51 in St. Peter, Minn. on Wednesday evening. Bri Monahan led the Gusties in scoring with 21 points. 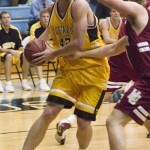 Jess Vadnais, who hit a big three-point basket to give Gustavus a 47-46 lead with 4:21 left, finished with 17 points. The Gustavus men's basketball team led by only one point at halftime, but outscored Hamline 42-25 in the second half to win 70-52 in its first Minnesota Intercollegiate Athletic Conference game of the season. Trevor Wittwer led the Gusties with a season-high 17 points. The Gustavus men's basketball team shot 63.8 percent from the field and cruised to a 110-64 non-conference win over Bethany Lutheran College in Saint Peter, Minn. on Monday night. The Gusties, who improved to 3-0 on the season, were led by sophomore Tyler Kaus who scored 20 points. The Gustavus men's soccer team pushed defending national champion Messiah (Pa.) to the limit in the NCAA Division III Men's Soccer Championship Final Saturday night in Greensboro, N.C., but could not come up with the win, falling 1-0 to the Falcons. 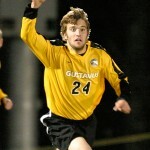 The Gusties, who finish the season at 17-3-5, held Messiah to one goal for the first time during the tournament. Messiah picks up its fourth national title in six years and finishes with a record of 24-0-0. Led by junior post player Bri Monahan, who picked up game-highs in points (27) and rebounds (11), the Gustavus women's basketball team defeated College of St. Scholastica 73-60 in the third place game of the UW-Eau Claire Thanksgiving Showcase. Gustavus improves to 2-1 on the season while the Saints fall to 1-3. The Gusties will open MIAC play with home games against Hamline on Wednesday and Concordia on Saturday. The Gustavus men's hockey team fell to 3-2-0 overall on the season Wednesday night with a 3-2 loss to Saint John's at the National Hockey Center in St. Cloud. Jon Keseley and Tim Ornell scored for the Gusties, which allowed three Johnnie power play goals in seven attempts. Gustavus will open its MIAC slate with a pair of home games versus Concordia next weekend, December 2-3. The Gustavus women's basketball team fell to 1-1 on the season following a 83-51 loss to Luther College Friday at the UW-Eau Claire Thanksgiving Showcase. Luther broke a 20-20 tie with a 19-2 run to take a 39-22 lead with 2:18 to play in 1st half. The Gusties got no closer than 11 in the second half. Junior post Bri Monahan led the Gusties with 16 points. Gustavus will face St. Scholastica in the consolation game at 6 p.m. on Saturday, November 26. The Gustavus men's soccer team advanced to the NCAA Division III Men's Soccer Championship Match against defending national champion Messiah with a 2-1 win over Whitworth College. The national championship match will take place at 4 p.m. (CST) Saturday afternoon in Greensboro, N.C. Sophomore Jeffrey Johnson scored the game-winner with 15 minutes to play in regulation. Women’s Basketball Game Statistics at UW-Eau Claire Will Be Available Live! Follow the Gustavus women's basketball team with live stats as they participate in the UW-Eau Claire Thanksgiving Showcase. The Gusties open the tournament on Friday, November 25 against Luther. Game time is set for 6 p.m. Click here closer to game time for live in-game stats. Sophomore guard Jess Vadnais scored a game-high 26 points as the Gustavus women's basketball team picked up a 78-70 season-opening win over Wartburg College Tuesday night in Waverly, Iowa. Junior Bri Monahan added 15 points despite sitting out most of the second half with foul trouble. The Gusties improve to 1-0, while the Knights fall to 2-1. Coach Mickey Haller's squad continues play this weekend at the UW-Eau Claire Thanksgiving Classic, facing Luther at 6 p.m. on Friday, November 25.